The Schüttgut exhibition is one of the most important trade fairs for the powder and bulk solids industry in Germany. The show will take place from the 21st till the 22nd of May and will be held in the heart of the industrial region Ruhr, in North-Rhine Westphalia, Germany's largest industrial state. At this trade fair manufacturers can discover the latest developments in the fields of solids processing, handling, storage and transport. With the growing interest for the sustainability of production processes, the Schüttgut exhibition will be held together with Recycling-Technik, a trade show for recycling processes and technologies. This co-location enables providers of solids technologies to tackle challenges like the reduction of consumption of energy and raw materials, as well as the reduction of production costs. At Recycling-Technik visitors can discover the scope of the newest products and technologies on the market for the collecting, sorting, prepping, reutilizing and disposing of reclaimable materials. Russell Finex, manufacturers of separation equipment, are proud to present their high quality industrials screeners, which can be used either for solids processing or recycling processes, at Schüttgut. This year Russell Finex will showcase new sieving equipment and innovative products, including the new Russell Compact Self-Loading Sieve™, the Finex Separator™ with the new Gated Outlet™ and the Russell Compact Sieve®. The Russell Compact Self-Loading Sieve™ is a newly developed machine by Russell Finex. 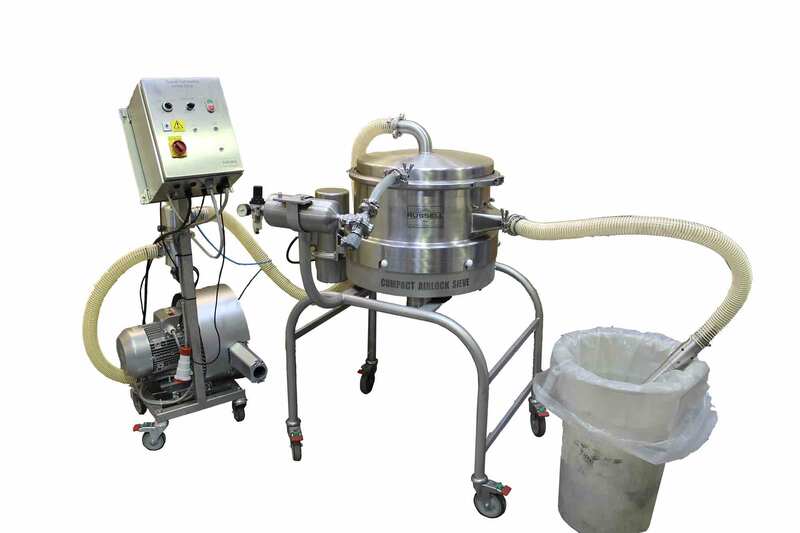 This pneumatic screener is designed to automatically load, sieve and discharge powders and granules. On the stand a working demonstration will be given, where you will be able to see the automatic operation and enclosed pneumatic screening. These two key features allow you to minimize operator involvement and safeguard the health of your employees. Another popular machine on the stand will be the Finex Separator™ with the new Gated Outlet™, which will also be shown in full operation. When grading, sizing, sorting or sieving dry or wet material, the Finex Separator™ is the most appropriate equipment on the market. Installed with up to 4 sieve decks, this vibratory separator enables you to obtain 5 product fractions in one single and simple operation. On the stand the Finex Separator™ will be fitted with the new Russell Gated Outlet™, a pneumatic gate which controls the oversize flow of the product on your mesh screen. By inflating or deflating the gate discharge of your product is controlled, allowing you to benefit from increased productivity, improved screening efficiency and reduced loss of good product. Lastly the Russell Compact Sieve® will also be on display. This vibratory screener is ideal for the removal of oversize contamination as well as the check or safety screening of powders and slurries. These machines fit easily in your production line, even where headroom is limited. The Russell Compact Sieve® on the stand will be a fully stainless steel version, which is ideal to process food or pharmaceutical products. If you would like to know more about Russell Finex and our equipment please visit our stand F08 in Hall 4. There experienced Russell representatives will be at hand to help you with any of your requirements. Pneumatic screening without the need for additional conveyors or discharge systems.